No one can undo the damage from the tar sands pipeline that gushed onto my family's land. My only hope is that this disaster can serve as a powerful warning. Will you march on June 6 to protect our land and waterways from more oil disasters? 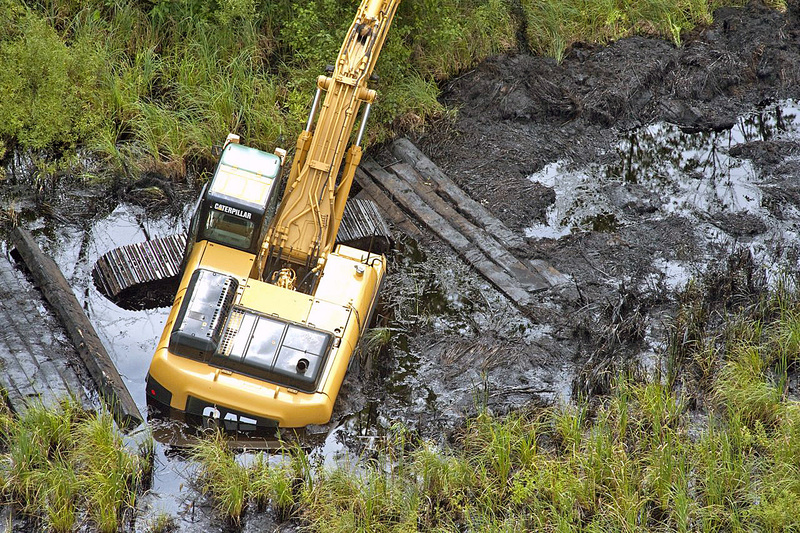 Cleanup equipment stuck in tar sands oil after more than one million gallons were spilled in Talmage Creek on my grandfather's Michigan farm. My name is Carter Zinn. From the age of 13 on, my father grew up on a 420-acre farm outside of Marshall, Michigan. I used to visit this farm for a week every summer as a child and some of my most cherished memories are from these trips. Now, thanks to the oil industry, our land is unrecognizable and unusable. In July 2010, a tar sands pipeline operated by Enbridge ruptured, spilling more than one million gallons of toxic heavy crude oil into Talmage Creek, which ran through our family farm. From there, the oil flowed into the Kalamazoo River, which in turn feeds into Lake Michigan. Permitting more pipelines carrying dirty tar sands oil, with the real risk of spills that comes with them, is the exact opposite direction in which we need to be headed when we should be decreasing our dependence on fossil fuels. That's why my family and I are supporting the Tar Sands Resistance March. Will you join us and march on June 6? This story has been playing out the same way, for landowners across the country, for decades. In 1968, Enbridge's predecessor approached my grandfather with plans to run their oil pipeline through his farm. I think they offered him a one-time payment of about $700. My grandfather protested, and an eminent domain hearing was held. The commissioners decided there was "necessity" for the pipeline and approved the seizure of our land. At the hearing, my uncle asked the pipeline representative what would happen if the pipeline ruptured and spilled oil onto our land or the rivers flowing through it. The engineer representing the pipeline company stated under oath that if a rupture occurred, there was a pumping system that would automatically shut down the flow of oil that would prevent a major leak from occurring. In fact, the engineer said there were at least two more fail-safe systems behind that one, any of which on their own would shut down the pipeline if a leak were detected. My grandfather took some measure of relief knowing these safety measures were in place, and that apparently there was little risk of a substantial leak occurring on our land if the pipeline were to rupture. Sadly, none of the assurances made to my family turned out to be true. This is what happens when pipeline companies and federal regulators ignore the necessary inspection and maintenance needs of oil pipelines. Friend , my family has seen first-hand the horrible damage tar sands pipelines can do. Will you help us put a stop to tar sands by joining the Tar Sands Resistance March on June 6 in the Twin Cities? RSVP now. No one can undo the damage done by the Enbridge pipeline that gushed tar sands oil onto the land I played on as a child. Plans of building homes there and putting the land to use in a way that would benefit the community my father and grandparents loved are lost. My only hope is that this disaster can serve as a powerful warning of the unacceptable risks of dirty fuels and tar sands pipelines, and can hopefully have a positive effect on accelerating our society's necessary transition from a fossil fuel-based economy to clean energy. I don't want landowners in the path of the proposed Keystone XL pipeline, or the numerous tar sands pipelines Enbridge wants to build or expand across the Midwest, to experience the same tragedy my family went through. Allowing more toxic crude oil to be shipped through an aging and essentially unregulated pipeline system will put our communities and rivers at needless and unacceptable risk. Just look at what happened near Santa Barbara last week, and imagine that, or worse, on the Great Lakes. Will you join me in fighting to protect our cherished land, rivers and lakes from more oil disasters by being part of the Tar Sands Resistance March?